Eleanora Fagan, commonly known as Billie Holiday, was an entertaining international jazz singer. She was born on April 7, 1915, in Philadelphia, Pennsylvania to her parents, Sarah Julie and Clarence Holiday. Billie Holiday had a rough childhood. Her mom was addicted to drugs and had a number of bad relationships with men. At a very young age, Billie experienced abuse herself. When she was only 10-years-old, she was raped. Sent to a home for troubled girls, Billie was accused of seducing her attacker. A few years later, she began working at a house of prostitution called “Marble Stoop” and was soon arrested. Billie had many obstacles to overcome. In 1941, Billie married Jimmy Moore. Moore, was very abusive and took Billie’s money while she was in jail. Through her hardship, music became very important to Billie. She began to develop a passion for jazz. In her early 30’s, she started singing at a nightclub. This is where she first sang her most well-known song, “Strange Fruit,” which is about lynching in the south. Sadly, Billie then started using heroin and many other drugs. This destroyed her singing career. On July 17, 1959, she died from cirrhosis, a disease that is caused by alcohol and drug use. She was no doubt one of the most influential of jazz singers of her time. 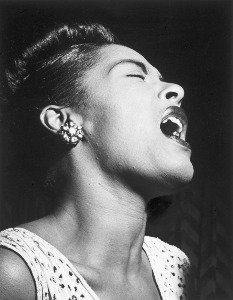 Billie Holiday will always be thought of as an amazing jazz singer despite her battle with drugs.